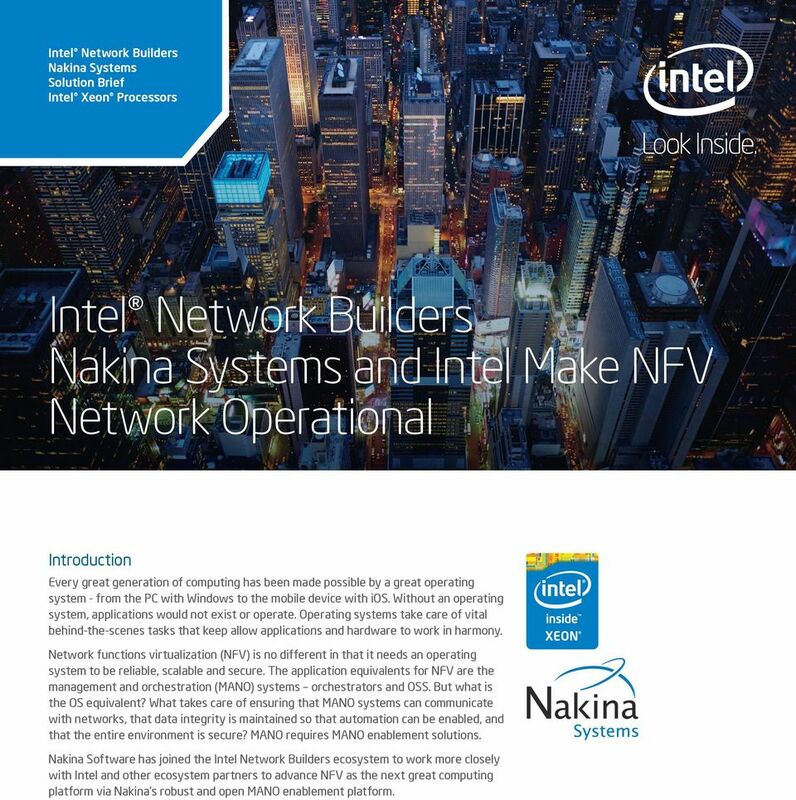 1 Intel Network Builders Nakina Systems Solution Brief Intel Xeon Processors Intel Network Builders Nakina Systems and Intel Make NFV Network Operational Introduction Every great generation of computing has been made possible by a great operating system - from the PC with Windows to the mobile device with ios. Without an operating system, applications would not exist or operate. Operating systems take care of vital behind-the-scenes tasks that keep allow applications and hardware to work in harmony. 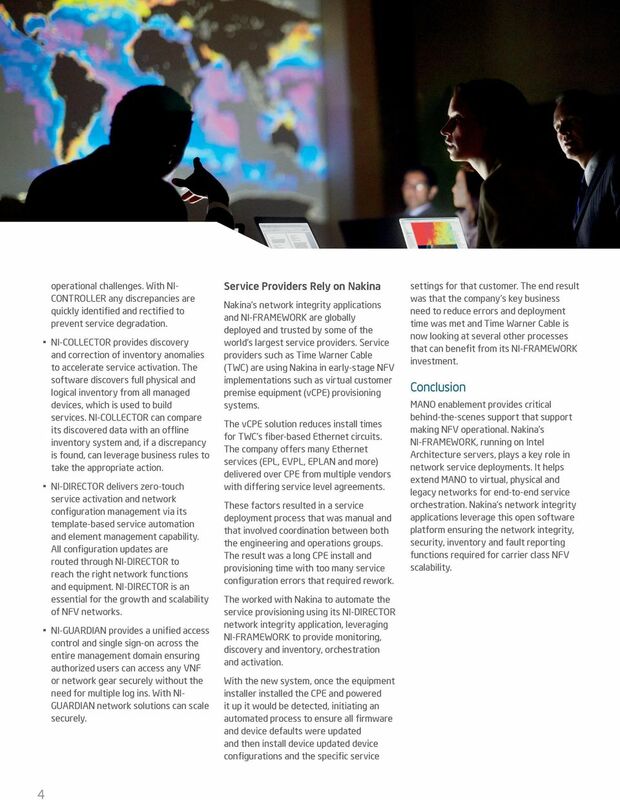 Network functions virtualization (NFV) is no different in that it needs an operating system to be reliable, scalable and secure. 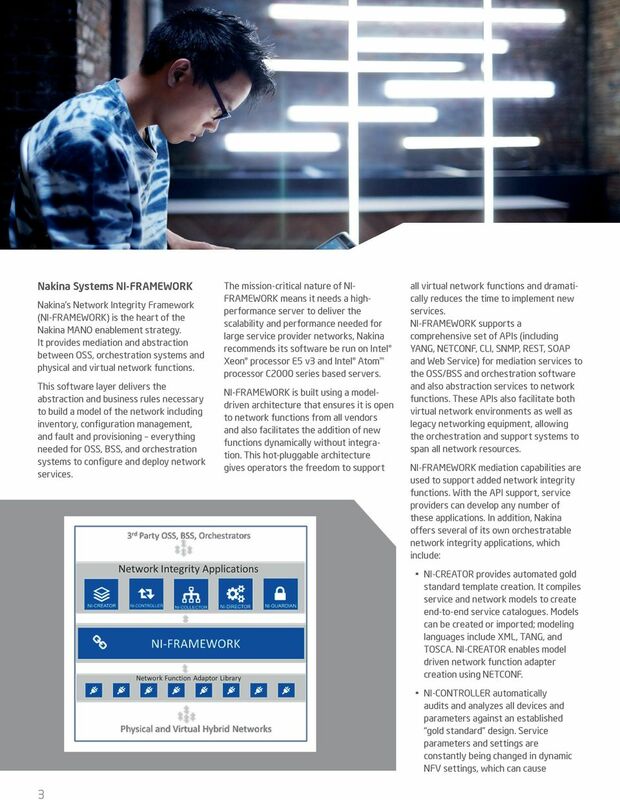 The application equivalents for NFV are the management and orchestration (MANO) systems orchestrators and OSS. But what is the OS equivalent? What takes care of ensuring that MANO systems can communicate with networks, that data integrity is maintained so that automation can be enabled, and that the entire environment is secure? MANO requires MANO enablement solutions. 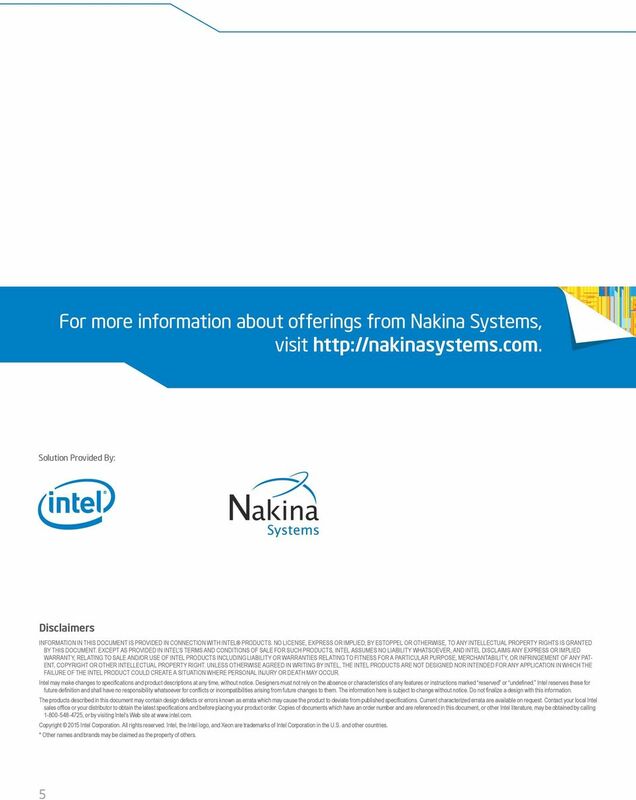 Nakina Software has joined the Intel Network Builders ecosystem to work more closely with Intel and other ecosystem partners to advance NFV as the next great computing platform via Nakina s robust and open MANO enablement platform. 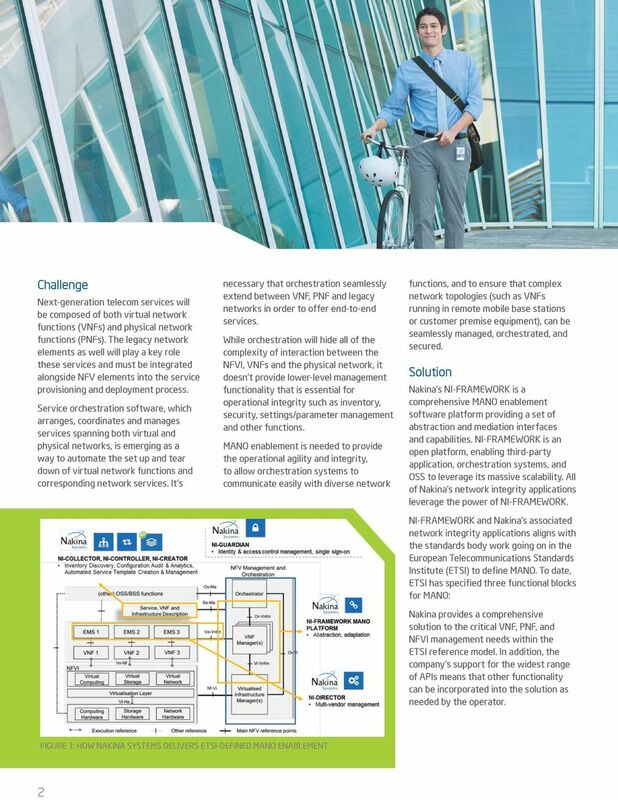 Solution Brief GENBAND* Virtual Network Functions Intel DPDK Intel Xeon Processors Network Transformation NFV, Cloud, and SDN Networking solutions from GENBAND and Intel move beyond simple virtualization. Intel HTML5 Development Environment Tutorial Test & Submit a Microsoft Windows Phone 8* App v1.00 : 04.09.2013 Legal Information INFORMATION IN THIS DOCUMENT IS PROVIDED IN CONNECTION WITH INTEL PRODUCTS.